That's good for the freshwater supply, but it's a double-edged sword. Imagine a river flowing through the sky – and all of its water dropping down to earth. That’s kind of what happens during many winter storms on the west coast. 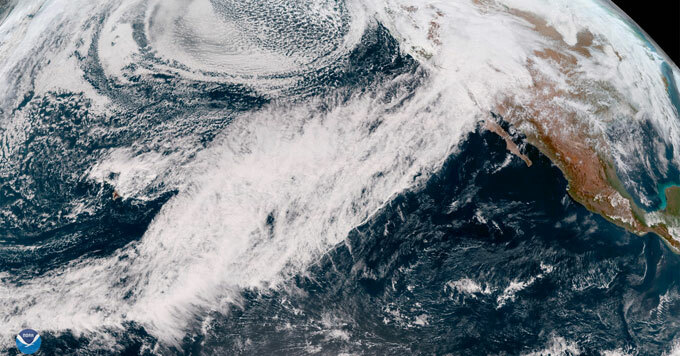 A so-called “atmospheric river” is a long, flowing band of water vapor – typically a few hundred miles wide – that contains vast amounts of moisture. When it moves inland over mountains, the moisture rises, causing it to cool and fall to earth as rain or snow. Duane Waliser of NASA’s Jet Propulsion Laboratory says atmospheric rivers are often beneficial, because they provide about half of California’s fresh water supply. But strong atmospheric river systems can also be dangerous – especially when they stall, or produce rain on top of snow. Because even in places facing drought, when too much rains falls at once, it can cause more harm than good.